Four years ago to the day, Microsoft sued Motorola over Android. A few days later, Motorola sued Apple. 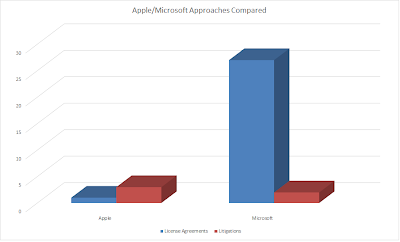 Disputes between Oracle and Google, Apple and HTC, as well as Nokia and Apple were already ongoing. In early October 2010 I decided to focus on smartphone patent disputes (as a blogger and as a consultant). I saw some key IP issues that had to be resolved, and I thought it would take about a year and a half for most of these to be sorted out. A year and a half is roughly the time an ITC investigation used to take. 48 months later, Motorola still hasn't taken an Android patent license from Microsoft, though more than two dozen other companies have. After more than 40 months of litigation, Samsung still hasn't paid Apple a cent. Nor has Motorola, which agreed on a ceasefire with Apple, but not on a license deal. And Oracle v. Google ceased to be a patent dispute about two years ago when Oracle decided to rely exclusively on copyright, which worked out so well that Google is now on the losing track and will presumably file a last-resort petition with the Supreme Court next week. "World Wide Smartphone Sales Share" by Smartmo - Own work. Licensed under CC BY-SA 3.0 via Wikimedia Commons. 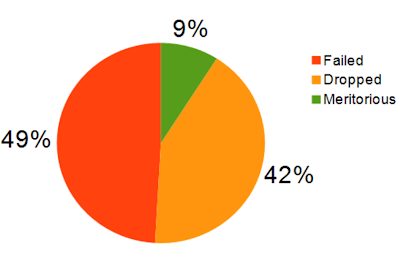 The number of patent assertions against Android was awe-inspiring. I visualized some of them with my signature battlemaps. While everyone gets sued by the trolls, Android was a unique lawsuit magnet with respect to assertions by very large players. And for the first couple of years, Android's rivals, despite a number of failed assertions, achieved some good results in court. But most of those temporary wins didn't last, and the ones that lasted didn't prove strategically impactful. Of course, just like there has been some fundamental change since certain interim decisions came down in 2012, there can again be key developments in disputes that haven't been settled. Still, the time has come to take stock based on what the final or most recent decisions in those cases have been and on what the state of affairs was when various disputes were settled. Out of the 9% of cases (20 of the 222 assertions) in which liability was established (and not reversed so far, or not before a settlement), only 10 -- 4.5% -- resulted in lasting injunctive relief. And that number would most likely be closer to 3% if, for example, the patents underlying Nokia's German injunctions against HTC had come to judgment in the Federal Patent Court. What's more important than alternative scenarios is that none of the injunctions against the Android operating system itself (including its key apps) had enough impact to force someone into a settlement. 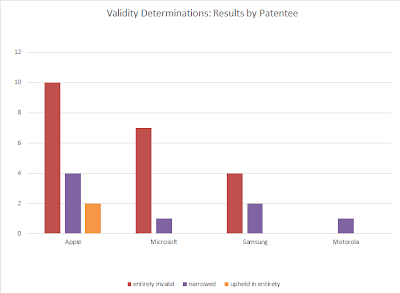 The 222 smartphone patent infringement assertions I've analyzed were brought by (in alphabetical order) Apple (against HTC, Motorola, Nokia, and Samsung), Microsoft (against Barnes & Noble and Motorola), Motorola (proactively against Apple and reactively against Microsoft), Nokia (against Apple, HTC, and ViewSonic), and Samsung (reactively against Apple). I focused only on three key jurisdictions: U.S., Germany, UK. Those are large markets in which I was able to research the cases, and in which substantial numbers of assertions had been brought. Otherwise the numbers of assertions would have been too low in certain jurisdictions to form even a remotely representative sample. This, by the way, "sandbagged" Samsung's results in my analysis because it prevailed on two SEPs in South Korea and on one in the Netherlands. However, Samsung had the best validity results of all the major litigants whose smartphone patents got challenged: it salvaged (albeit in a narrowed form) two patents in the Federal Patent Court of Germany -- i.e., as many as Apple, Microsoft and Motorola combined, though only three of its patents were adjudged there. Just wanted to mention this for the sake of accuracy. I could have included patent assertions by HTC (which countersued Apple in the U.S. and Germany, and Nokia in Germany) and Oracle (which, as I explained further above, is now relying exclusively on copyright in its dispute with Google). None of them went anywhere. But I wanted to focus on companies that brought large numbers of smartphone patent infringement assertions. If you scroll down there, just focus on the color-coded columns. The first one is liability (a valid patent was infringed), the second one is injunctive relief. The green (successful assertion) cells are few and far between, on the right side even more so than on the left side. Of course, one could have made a different selection and/or applied different criteria, and would then have arrived at slightly different results. 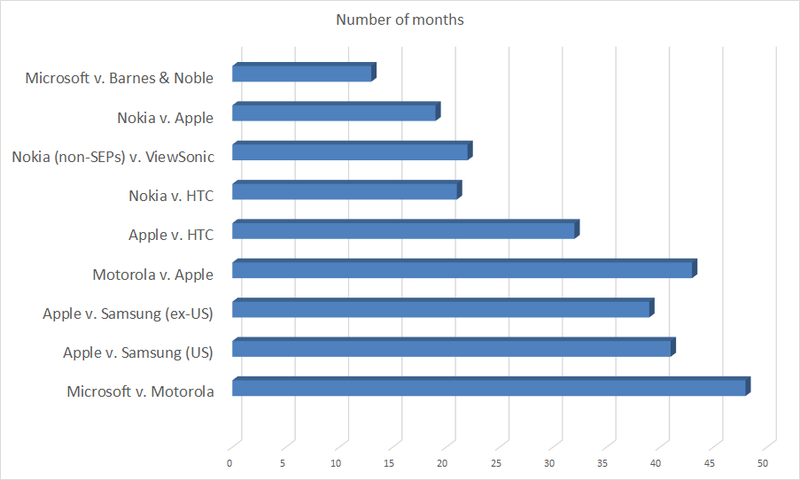 And the timing of settlements made some plaintiffs look better (for example, Nokia did benefit from this factor because of the relatively early stage of its German HTC cases) than others (for example, Apple likely would have "won something" on remand against Motorola at the ITC). In Apple's case, the analysis could be even more negative. For example, while it settled with HTC before any infringement ruling came down in its Munich cases, the patents were subsequently invalidated, but I decided to omit those cases from my list. I will reference this post in various posts over the coming months in which I'll discuss some potential conclusions -- political and commercial ones -- in detail. For now I'll just touch on a few of these and indicate roughly how I view all of this. Poor enforcement results suggest that zero-zero cross-license agreements between large players make more sense than huge balancing payments. These results support the argument for meaningful patent litigation reform in the U.S. (fee shifting and better defenses against weak patents, for example). 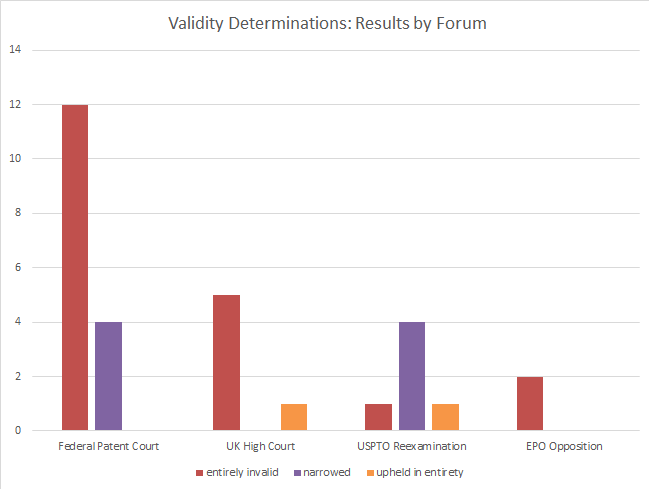 The fact that too many patents that get asserted don't withstand a validity challenge is by far the biggest issue. An early draft of a study by two Munich-based academics, Professor Joachim Henkel and Ph.D. candidate Hans Zischka, says it all in its headline: "Why most patents are invalid -- Extent, reasons, and potential remedies of patent validity" Highly recommended reading. One of the key findings is this: "For Germany, thus, more than 75% of all active patents are latently invalid, either fully or partially." My biggest concern in Europe is that, unless its rules of procedure are improved over previous drafts, there will be too many cases in which the Unified Patent Court will allow the Europe-wide enforcement of injunctions over patents that should never have been granted at all or never with a very broad scope. The smartphone patent disputes show that the bifurcation gap -- the problem of an injunction being enforceable before a patent is invalidated by another court -- is an extremely serious issue. I have uploaded to Scribd a list of six smartphone patent cases in which there were extended periods (between 13 and 23 months) between an injunction and a Federal Patent Court ruling that invalidated or narrowed the patent-in-suit. By contrast, there was not even one case in the ones I analyzed in which a German regional court stayed an infringement case and the patent was affirmed in its granted form or in a reasonably broad form. Finally, I want to clarify that this analysis is not meant to reflect negatively in any way on the judges or lawyers involved. Of course, some of the defensive victories are very meaningful, and in other blog posts I have mentioned who represented the different parties. For example, the attorneys at law and patent attorneys who enabled Samsung to fend off of all of Apple's German patent assertions and vice versa, or those who represented Motorola against Microsoft, or ViewSonic (under visible budget constraints, but with focus and dedication) and HTC against Nokia, undoubtedly did great work. But counsel for plaintiff were absolutely brilliant in many of these cases, regardless of results. For my own app development company's three PCT patent filings (all of them made in recent months) I've worked with a firm that was mostly active on the offensive side because I don't attribute their results in the Federal Patent Court to the quality of their work. So much for now. I'll talk about the issues outlined above, and others, in the months and years to come. There are some important issues to deal with. I hope this analysis contributes useful data points and observations to the debate.